The event was organized by the Nursing Research Council in KFSHRC and different professionals in nursing presented papers about various issues regarding research as well as abstracts of nursing research currently under way at the hospital. Dr. Sultan Al-Sedairy, executive director of the research center, inaugurated the event by emphasizing the impact of research in general on patient care, and specifically nursing research. He also acknowledged the support given to research by the government in terms of funding. Executive Director of Nursing Affairs Judy Moseley and Chairperson of the Nursing Research Council Dr. Muna Anani also gave opening remarks. During the sessions nurses from different specialties presented papers including one by Heather Kirby on the scientific rigor in nursing and health care that stressed excellence in health care begins with evidence while showing the relation between nursing research and evidencebased practice (EBP). In her presentation she showed how nurses were previously able to improve practices in KFSHRC and elsewhere through research that led to evidence based practices. Anani also gave a presentation about ethical considerations in nursing research, highlighting the role of nurses as advocates for patients in order to prevent them from participating in unethical studies. She went on to discuss the main ethical principles including autonomy, beneficence, and justice. Developing a research question was the focus of Sofia Macedo’s presentation that addressed the critical issue of identifying and establishing the research question. Dr. Ayman Mohammad addressed the important issue of sample size in his presentation, introducing the principle of sample size calculation and the significance of using an appropriate sample size. He also discussed methods and software programs used to calculate sample size. Following that, various nurses presented abstracts of their research. Examples of the research presented include Joanne Ordonio and Ahmad Amro’s project exploring the usage of humidification of air or oxygen for the treatment and prevention of chemotherapy/radiation induced mucositis, Mai Hassan and Mabelle Bitar’s research on the impact of comprehensive patient education on the readmission rate of heart failure patients, and Nada Al-Harbi’s research on communication between nurses and physicians and the former’s perception of effectiveness and satisfaction. On the sidelines of the conference, Macedo told Arab News about the importance of conveying to nurses the possibility of research and that it is not something only for physicians or scientists. Macedo added the only way to improve nursing care in a sustainable way is through developing knowledge, which can only happen if health professionals are motivated to conduct research, making it not only possible, but rather a responsibility nurses must heed. She went on to say that KFSHRC is the leading hospital in Saudi Arabia in terms of support and incentives for nursing research, adding in the United Kingdom for example, most nursing care is based on nursing research. 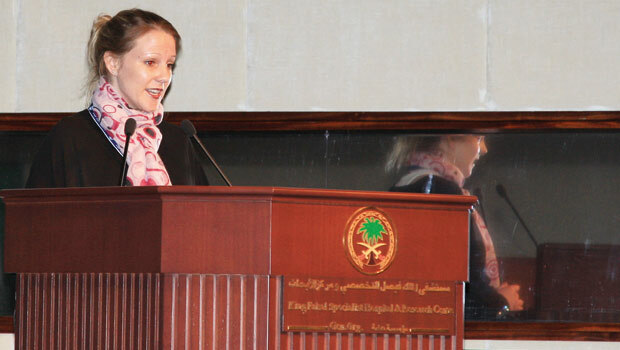 When asked about Saudi nursing students, Macedo said every year the nursing instructors see improvements in the students they get in terms of perspective, passion, and critical thinking, and with the new strategy of supporting nursing research, the students will soon have easier access that facilitates their research process. He noted KFSHRC has maintained for many years a high status among all health care providers due to the strength of its research. “We see that in many instances the research of yesterday became today’s medicine, as the research of today will become tomorrow’s medicine,” stated Al-Sedairy. “And this is one of the implications of research: Innovation that creates new knowledge, new capabilities, and new opportunities to treat patients and prevent diseases. He explained how the research capabilities of a health care institution define its medical and scientific status and even its trustworthiness, since most surveys conducted in the United States show that when patients are asked to justify selecting a certain hospital they often refer to the institute’s research capabilities as one of the top reasons. Al-Sedairy also observed that research creates a regulatory environment where patients receive the best possible care because they are monitored and analyzed thoroughly, which is documented in medical literature. Furthermore, he talked about the advances seen in patient care due to research, citing different research projects conducted at the center years ago and are now routine diagnostic services such as the latest addition to IVF routine processes which is pre-implant diagnosis , a process initiated as an experimental model in KFSHRC and is now a routine service offered to people who are carriers of genes that cause diseases and enabling them to select a healthy embryo. Commenting on the status of KFSHRC in the region, Al-Sedairy said it maintains a leadership position in the health care industry in the region in regards to the impact and citation rate of its research. He proudly underscored the role of women in the research center and said they accounted for half of total staff and distinguished themselves with high caliber research and productivity gaining national and international awards.